TSMS CET 2018 Notification online exam to 6th class TSMS Telangana Model Schools 6th Class Entrance Test 2018 Notification - Online Application Form @telanganams.cgg.gov.in apply up to 16th February 2018. 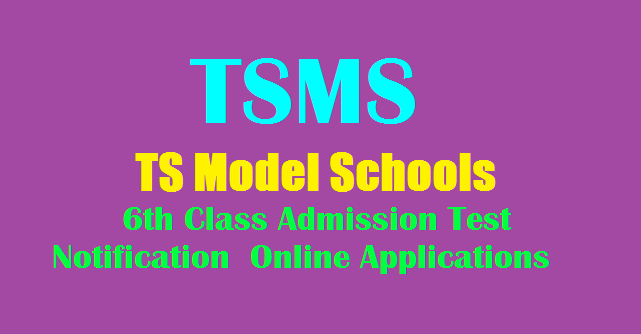 The TSMS Admission Test 2018 exam dates and other details are clearly mentioned in the tsms notification 2018. ts model schools admission test 2018,tsms 6th/vi class entrance test 2018,tsmscet, tsms online application form, tsms admission test 2018,fee,how to apply, telanganams.cgg.gov.in Recently director of school education of Telangana has taken a decision to conduct of admission test through online mode from the academic year 2018-2019. The mode for admission in to VI class is through online admission test and lateral entry in classes VII to X as per available vacancies at the time of model school admissions. Submission of ts model school application form 2018 through online mode only it is available from 23rd January 2018. Authority will provide facility of downloading of ts model school hall tickets 2018 from 11th April 2018 Telangana State Model School Admission Entrance Test Online Application form to Apply Online | Schedule for Admissions into Telangana Model Schools for the Academic Year 2018-19 to get Admission into 6th Class Telangana State Model Schools Society released Activity Schedule issue of Notification starting of Online Application form availability of Hall Tickets at Official website www.telanganams.cgg.gov.in Exam Dates Results Merit Selection List Download from same web portal verification of Certificates counselling schedule and commencement of Classes details here. Model Schools have been introduced in earsthwhile Andhra Pradesh under Rashtriy Madhyamika Shiksha Abhiyan RMSA with central funds in 2012. Model Schools in both AP and Telangana performing well and producing Good Results. TS and AP Model Schools providing Free Education in English Medium with better quality to the poor rural children in the said states. Every year The Model School Society taking Admissions by conducting Entrance Test into 6th Class. This is better opportunity to the poor children who can not bare private Schools fees. Candidate seeking admission into VI Class should have completed 10 years of age as on 31st August of the Academic year 2018-19. TS model school 2018 exam will be held on 15th April 2018 Duration of Examination is 2 hours. The Question Paper contains 4 sections as shown below in objective type with multiple choice. The Question Paper booklet will be based on V Class syllabus. Candidates who showed interest in this Telangana model school admissions 2018 to filled and submitted the application forms before the last date. Applicants can also download TSMS Admit Card 2018 by clicking on the active link given below. Click on view button to check exam tsms exam venue details, tsms roll number, and exam date. Telangana model school applications are available in online in TSMS official website. So candidates who are interested can register from 23rd January 2018 through online application process. The last date for submission of online application form is 16th February 2018.